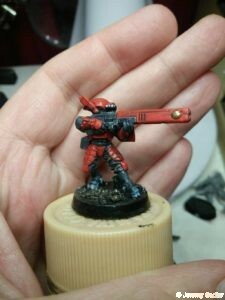 When Tau came out for Warhammer 40k years ago I picked up a force and mostly assembled it. Then as my interests diverged it sat unpainted in storage. 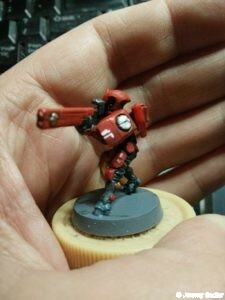 With the release of Shadow War: Armageddon and my renewed interest in Games Workshop after many years break, I’ve decided to paint up my Tau for use with that game – needing only approximately ten figures. My initial test was for glass black armour (cool!) in black fatigues, suitable for a reconnaissance unit in a dark environment. I did not like this at all so abandoned that idea and this figure will be stripped later. I’m a big fan of red, so my next attempt is a basic red scheme and I much prefer it. I’m very happy with this colouring and with a few touch-ups and basing it will be finished. I can then start the hard work of building the rest of the force. 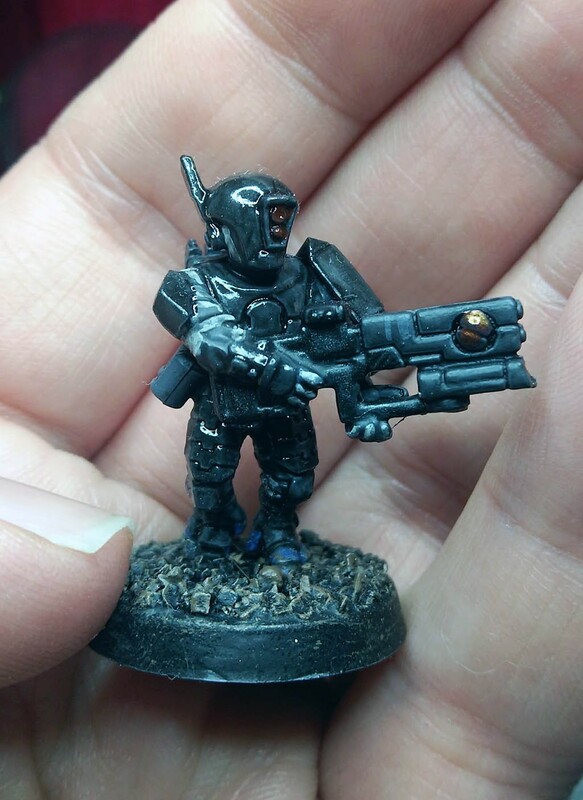 Tau in Shadow War are “Pathfinders” (scouts), lightly armed and armoured. The figures I have are “Fire Warriors”, which are line infantry. They will do as suitable stand-ins for the moment as I have the figures already sitting around, and I can use the same figures for Kill Team or even Warhammer 40k.